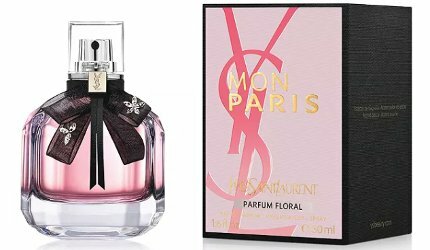 Yves Saint Laurent has launched Mon Paris Floral, a new fruity floral flanker to 2016's Mon Paris fragrance for women. A floral interpretation of the classic Mon Paris signature. Notes of fresh pear and white musk are enlightened by a floral bouquet of peonies. Experience the thrill of a blossoming love story with Mon Paris Floral, the floral interpretation of the iconic Mon Paris signature. A fruity top note of pear opens to a blooming floral heart of peony, rounded out by white musk. The classic Mon Paris bottle shape with a precious floral lavaliere adorned with crystal petals inspired by the floral ornamental style of Saint Laurent Couture. Yves Saint Laurent Mon Paris Floral is available in 50 and 90 ml Eau de Parfum.